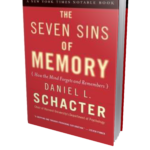 The Seven Sins of Memory: How the Mind Forgets and Remembers - Jon Lieff, M.D. This is now a classic book on the common failings of memory. Like the Invisible Gorilla it shows the limitations in every day mental function. It tells how memory fades and changes, the sin of transience. It observes that without attention, people become absent minded. Professor Schacter discusses the well-known failings of suggestibility, and bias. The other sins are blocking, misattribution, and persistence. This is a pioneering book that had broad implications for the changes that are now occurring in the courts concerning eyewitness testimony.